Though these are not crimes that normally get people arrested and in trouble with the civilian authorities, they can be UCMJ crimes that get an officer in such trouble with the military, that he/she may not make the next rank and be forced to leave the military. If a midshipman or cadet commit any of the above crimes it is highly unlikely they will graduate their officer training program (Service Academy, ROTC, OCS). If a junior officer, what are normal advancements from 0-1 to 0-2, or 0-2 to 0-3 given time in the military, could be what prevents a junior officer from making the next rank. Here are the details of the UCMJ offense - Conduct Unbecoming an Officer. (2) Nature of offense. Conduct violative of this article is action or behavior in an official capacity which, in dishonoring or disgracing the person as an officer, seriously compromises the officer’s character as a gentleman, or action or behavior in an unofficial or private capacity which, in dishonoring or disgracing the officer personally, seriously compromises the person’s standing as an officer. There are certain moral attributes common to the ideal officer and the perfect gentleman, a lack of which is indicated by acts of dishonesty, unfair dealing, indecency, indecorum, lawlessness, injustice, or cruelty. 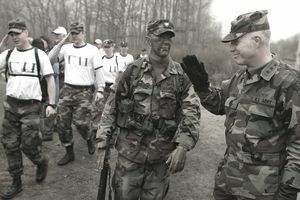 Not everyone is or can be expected to meet unrealistically high moral standards, but there is a limit of tolerance based on customs of the service and military necessity below which the personal standards of an officer, cadet, or midshipman cannot fall without seriously compromising the person’s standing as an officer, cadet, or midshipman or the person’s character as a gentleman. This article prohibits conduct by a commissioned officer, cadet or midshipman which, taking all the circumstances into consideration, is thus compromising. This article includes acts made punishable by any other article, provided these acts amount to conduct unbecoming an officer and a gentleman. Thus, a commissioned officer who steals property violates both this article and Article 121. Whenever the offense charged is the same as a specific offense set forth in this Manual, the elements of proof are the same as those set forth in the paragraph which treats that specific offense, with the additional requirement that the act or omission constitutes conduct unbecoming an officer and gentleman. Dismissal, forfeiture of all pay and allowances, and confinement for a period not in excess of that authorized for the most analogous (similar) offense for which a punishment is prescribed in this Manual, or, if none is prescribed, for 1 year.